German surname images courtesy of Verwandt.de. Click on the images to expand them. My nineteenth century immigrant ancestors have caused me a lot of headaches. With the exception of my Muir ancestor, Robert, who listed his specific birthplace, my immigrant ancestors were very vague in listing their birthplaces on records in the U.S. Though most of my ancestry is Irish, I have a German line that has always interested me. My great-great-grandfather, John Henry Hampe, came to the New York in 1872, and eventually moved to Boston. Though he claimed to have been naturalized in later census records, I was never able to locate a naturalization record for him, which I hoped would list his birthplace. Curious to know where the Hampes came from, I wondered if there was a way to locate the general area the surname comes from in Germany. I found a German genealogy site, Verwandt.de. Unfortunately, when I searched the Hampe surname, it seemed to be present in many parts of Germany, which didn’t help to narrow down my search. I later found out that ten years after John Henry Hampe came to the United States, his parents John Andrew and Maria Teresia Hampe, as well as his siblings, also came to America. In tracking them forward, I came across the death certificate of Maria T. Hampe, dated 26 December 1919. Fortunately, my great-great-grandfather was the informant, and listed her parents, Henry Hoge and Maria Heskamp. With this additional information, I was able to use the German surname map to narrow down the likely origin of my family in Germany. Based on the German surname distribution maps, my family appeared to come from a region in Western Germany. I was eventually able to track down a naturalization record for one of John Henry Hampe’s brothers, Conrad; Conrad states that he was born in Lingen, Germany, a town in Emsland, Lower Saxony, and a region where all three surnames appear on the distribution maps (the region is highlighted in red on the Heskamp map at left). Several countries have similar surname distribution maps. For Irish research, The Irish Times has compiled a surname search for Irish surnames found in mid-nineteenth century Ireland. 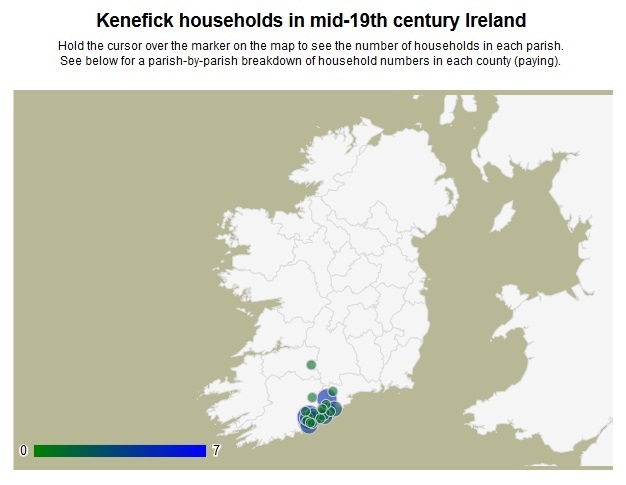 Though helpful when searching for my Kenefick ancestors, who seem to originate in County Cork, the Hughes surname is widespread throughout Ireland, and such maps don’t necessarily help me wade through the many Patrick and Mary Hugheses living in Ireland in the 1800s. Though challenging if the name is common, surname distribution maps can be a helpful way to begin research in your immigrant ancestor’s home country. They can be particularly beneficial, as in the case of my Hampe ancestors, if you know additional surnames, such as their parents’ surnames or the maiden names of their wives. 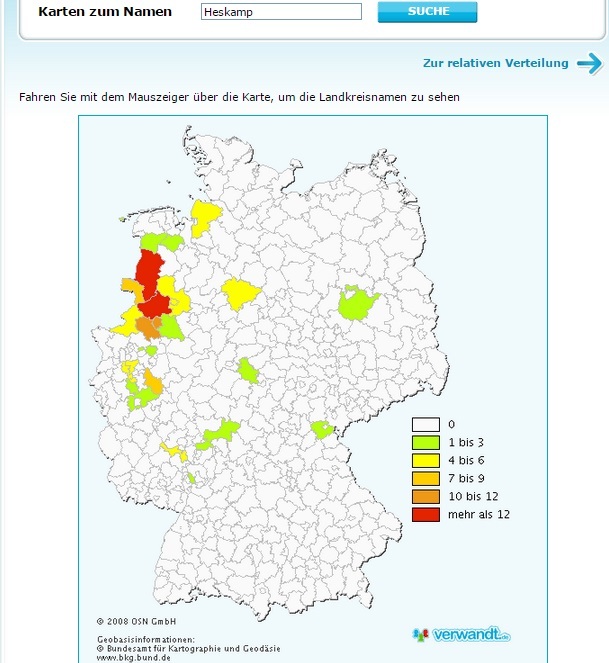 Thank you so much for the German surname map link. My German immigrant ancestor has been a brick wall at least since 1922, when a family history said Hans Wagner “might have been Dutch, or German, but judging by his character, was probably German.” He can be traced to the Carolinas in 1730, but I think he’s being confused to a Charlotte man named John Waggoner. I plugged “Wagner” into the search engine in Verwandt.de. While I don’t read German, it seems to provide current surname distributions, which could be extremely different from 18th c. distributions. Most of the Wagners were clustered in many provinces in the west and south, with a large sprinkling in widely separated areas in the east. The only thing that looked definitive was that few showed up in the north of the country. I remember about fifteen years ago learning that church records from the period of interest to me were being put online. Getting in touch with someone involved in that process, I was told that unless I knew his home town, I’d never find someone named Hans Wagner. “It’s like looking for John Smith in America,” he said. So while this resource looks like it might help my niece-in-law named Roedescheimer, I’m not sure it’s going to help me a lot! Highly interesting, though, as I’ve always been a huge map fan. I also am a Wagner researcher, and sadly, have two branches, one out of Schwiegen, which I did not know the last time I used Verwandt.de. the other burned his bridges at almost every turn, and I may never find a record for him, as he was born in Poland to German parents who are vaguely rumored to have come from Engen, but I can find no proof of that. If you are interested in surname maps there is a Facebook Group which regularly posts resources on surname maps. Thanks for the *very* interesting article. I’m researching an ancestor named “Ober”. I know only that he was born in New York State about 1830. Do you know of any surname mapping resources for the early US? Thanks. My great-grandfather was Conrad G.G. Hampe. (Born August 19, 1863, naturalized October 14, 1901). I have done internet research over the years, and have uncovered more Hampe details/records from Germany going back to the 1700s. I’ve found online a photograph of Maria T. Hampe, as well as her birth and marriage records, and her parent’s wedding record. She was born in Ibbenbueren in 1834, and married Johannes Andreas Hampe August 15, 1853 in Lingen. I also found evidence that Johannes Andreas Hampe’s father was a soldier of the Kingdom of Westphalia during the Napoleonic wars. I also have Irish roots as well (50% German & 50% Irish on both sides).